The Price of Victory, published by DK Publishing, 48 pages, $3.99. DK Publishing has developed a series of books utilizing sequential storytelling as a reading aid for children. Aimed at four different levels of readers, from beginning to proficient, these “Graphic Readers” provide engaging stories and impressive art. 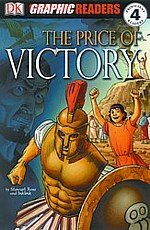 I recently read the Graphic Reader entitled The Price of Victory, and now I can’t wait until my children are level four readers. Kinesias is a Greek athlete who is preparing to compete in the Olympic Games in Athens, unless a rival runner is successful in keeping him out of the games. Told from the perspective of Kinesias’ younger brother, Pylades, the story takes young readers into an exciting tale of adventure and intrigue. It would also appear to open opportunities for parents to strike up conversations with their children about fair play, honesty and doing your best in all of your endeavors. It’s refreshing to see that, despite being created for young readers, the work includes interesting characterization. Pylades serves as a young Greek “Hardy Boy” of sorts, as he aids his brother in finding out who is trying to keep him out of the games. It’s easy to see how readers, boys or girls, could get caught up with this character. Kudos to writer Stewart Ross. Also indicative of this book is attractive artwork by Inklink. Who is Inklink, you ask? I couldn’t begin to tell you. But, whoever he, she or it is, readers are treated to an expressive style with clean lines and an entertaining (and only occasionally confusing) use of panel arrangement. Not as cartoony as some might expect for this type of work, Inklink actually gives the characters quite a bit of personality. A map, timeline and illustrated glossary makes this book educational, as well as entertaining. What more could a parent ask? The Price of Victory is recommended for older child readers. Parents should seek it out at comics shops, online retailers and auctions or at www.dk.com .